Use pallets, 2 x 4's, plywood, anything that will keep your items off the floor of the unit. Use plastic to cover your belongings. It retains moisture. Store any food items. This will prevent any unwanted guests. Pack your boxes so that they are too heavy to carry them, especially when you are packing books. Assume that your homeowners or renters insurance will cover your belongings while in storage. Purchase the insurance. Give out your password, gate code or any information to any one that is not listed as having access. Use printed newspaper for wrapping. The ink may smudge and get on your items. Forget to clean appliances before you store them. Store any toxins or flammables such as paint, oil, or gasoline. Not sure which unit is right for you? 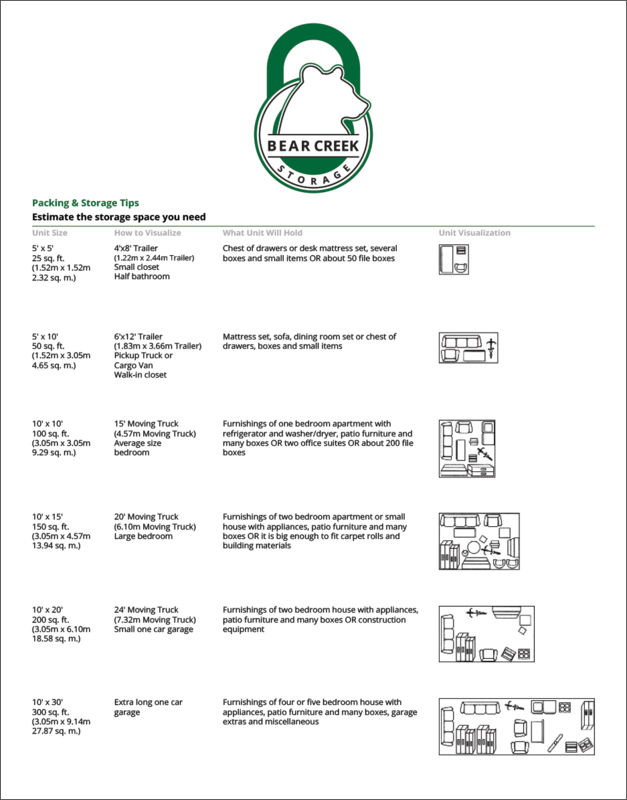 Use this handy chart to help you determine how much space you need.